Target is a store near and dear to Minnesotans, and now the country. The Dayton Brothers were first confronted with the idea of a discount store in 1960 when Ira Hayes of the National Cash Register Co. spoke at a monthly Dayton’s management meeting about the trend of discount houses in the old textile mills in New England. 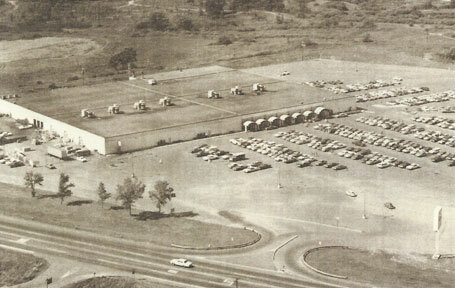 One of the stores they visited when formulating their plan was TOPS, which would come to St. Louis Park in 1963. 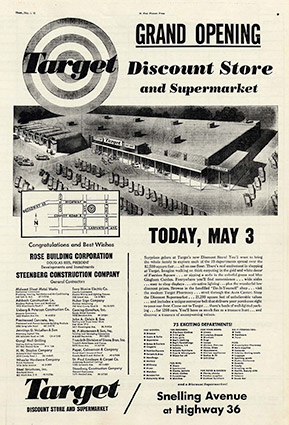 The first Target store in the country opened on May 1, 1962, on Snelling Avenue near County Road B in Roseville. Coincidentally, 1962 was also the year that the first Kmart and Wal-Mart stores opened. The Roseville Target store was demolished and rebuilt in 2005. The third Target store was in Crystal, and the fourth in Duluth, all opened in 1962. 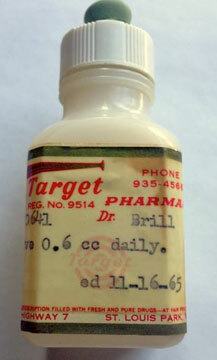 Target began opening on Sundays in January 1964. This was against the State’s “Blue Law,” and the case went to court. The law was quickly changed as other stores followed suit in order to compete. In 1967 the Dayton Company went public, becoming the Dayton Corporation. In 1969 the Dayton Corp. merged with J.L. Hudson Company of Detroit and became the Dayton Hudson Corporation. Target has become so successful that the venerable Dayton Hudson Corporation changed its name to the Target Corporation in 2000. As of January 2011 there were over 1,750 Target stores in 49 states and the District of Columbia. The Dayton-Hudson Corporation opened its second-ever Target store at 8900 Highway 7 in St Louis Park on October 29, 1962. A review of the St. Louis Park Dispatch reveals no big announcement, nor any large Grand Opening ad. The first ad we find is from the November 8, 1962, issue, and is no different from the many Shoppers’ City ads already in the paper. The October 29 date comes from the Target Corporation itself. The 32-acre tract was part of 220 acres that belonged to Frank B. Hart in 1926. G. Fred Lohman of Calhoun Realty purchased the property (along with the future Knollwood property) in 1929. Lohman had originally envisioned the property as part of an expanded shopping center with stores and bridges on either side of Minnehaha Creek, but couldn’t get commercial zoning for the western end. After Knollwood was built, the property (described in one memoir as a “slough” that had to be filled in) was eventually zoned commercial. Lohman was approached by K-Mart about building a store, and that made Lohman think of the Daytons, who were looking to go into the discount market. Dayton-Hudson purchased the property from Lohman for “virtually a million dollars for same and a million dollars in the early 1960s was not to be sneezed at,” wrote Lohman’s nephew. Behind the store was a dirtbike track that kids would spend all their nights and weekends riding on before apartments were built. Convenience or Problem? Leaving shopping carts in the parking lot is a convenience for shoppers, but a headache for the employees who have to round them up in the morning. 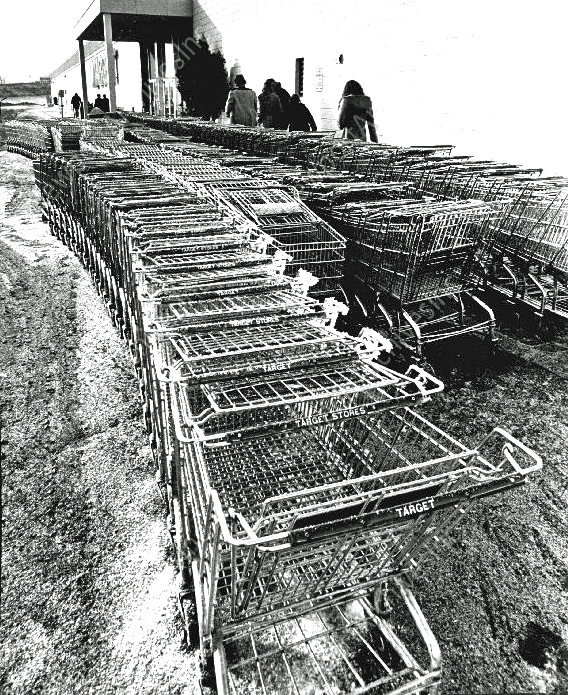 This batch of carts was collected Sunday morning in the parking lot of the Target Store on Highway 7. In the beginning, the store had a grocery store inside, simply called the Target grocery story, but owned and operated by Applebaum Food Markets, St. Paul. This historic Target store was demolished to make way for a SuperTarget. Corporate records show the closing of T-2 on January 8, 2006. The new store’s number is T-2189. Park’s second Target was built on a site that had been owned by the Baston family and Hedberg-Friedheim. The store was built in 1986, and has the address 3601 Highway 100, although access is from Park Center Blvd. In 2016-17 this store was renovated, but not to SuperTarget status.